Bengaluru, March 10 (IANS) A chance meeting with Prime Minister Narendra Modi in September 2015 in New Delhi inspired Bengaluru-based Grammy Award winner Ricky Kej to dedicate his life and music to the cause of environment. The voice in your ear has a certain crispness to it, over time, it has become gruffer, sand papery and rasping. It is one of India's most precious baritones, a ne plus ultra, mono typical and unique. 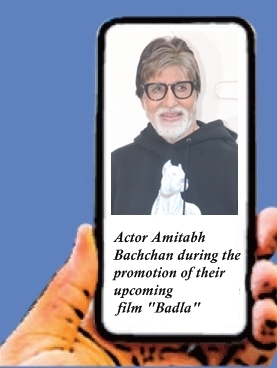 As he mouths a dialogue for his new thriller 'Badla', the growly voice resonates in my echo chamber: 'me vo 6 dekhu jo tum dikha rahi ho ya vo 9 jo mujhe dekhna hai''! It has a different quality about it, you don't need surround sound to support it, it stays with your residual memory. Amitabh Bachchan and his craft has captivated several generations now, ageless as he is, the thespian has completed 50 years in an industry which he straddles like a colossus. Mumbai, March 5 (IANS) Popular Telugu actor Mahesh Babu, who is producing the real-life war hero biopic "Major", says he would have loved to play Sandeep Unnikrishnan, the NSG commando who lost his life while rescuing many hostages during the 26/11 terror attack in Mumbai. But he is happy to have actor Adivi Sesh on board for the part.